This is a really neat construction toy from 1965 made by The Ohio Art Co. (makers of Etch a Sketch and Spudsie the Hot Potato) that you just don't see around very often. The set came in a blue plastic case housed in a red cardboard carrying-case. The inner structure contained 4 metal "stages" embedded in the top half, while the bottom half had 5 compartments full of different shaped magents. The idea was to construct magnetic structures, vehicles and figures on the metal stages by stacking the magnets. The set included bars, rectangles, discs, balls, arcs, cubes, triangles, parallelograms and non-magnetic seperators. 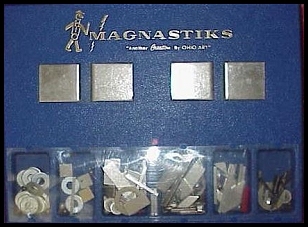 The kit also came with a "Maggie Rod" to help you pick the magnets up out of their compartments. The instructions included a brief lecture on "The Mystery of Magnetism", along with illustrations demonstrating many "Amazing Construction Results".